Can the Australians really teach us to be happy again? Since Tame Impala dropped Innerspeaker in 2010, there’s been a new psychedelic renaissance occurring down under. While we in the west wallow in our drab, draggy melancholic reverb-rock, the Aussies have been living large, melding thick, bassy leads with analog synths and a dancehall state of mind. Jagwar Ma, the latest practitioners of the new sound, have put beats at the forefront, sacrificing little of their fellow countrymen’s bombast and arena-ready flavor in designing a new kind of house revival. Australia is a land of mind-boggling emptiness. Straddled between coastal urban centers like Perth (home of Pond and Tame Impala) and Sydney (home of our subject) lie miles upon countless miles of barren red rock and sand. It follows that these bands have an acute understanding of space and how it can be molded - it’s in their DNA. Lonerism last year showed us just how big you can make a tiny room sound when you press the right buttons. 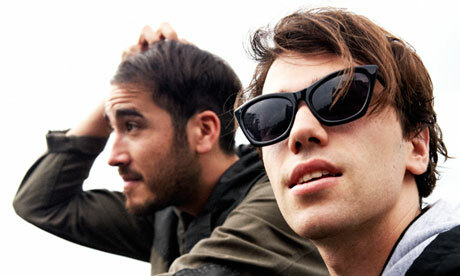 From the first moments of Howlin, Jagwar Ma’s debut, it’s clear they’re not far behind. The bass drum kicks for the first time and never seems to disappear, bouncing to infinity off of walls perfectly imagined by the trio. Synths peak and troth like softly rolling hills, and you’re gliding over on a swift cumulous. If you’re not cranking your headphones to max volume, you’re missing out. It’s not just marvelous engineering that carries this 51 minute party to completion. These guys can write songs. Yeah, they don’t sound like they’re saying anything, but the harmonies imbued in their senseless words? Beautiful. It sounds like the kind of music Animal Collective would love to be making if their reputation didn’t require a certain degree of arty ugliness. Comparisons to the Madchester and Acid House scenes of the late-’80s-early-‘90s are valid, but this music seems more natural growing up from between cracked red clay like old skin than the concrete smokestack forests of Manchester, as if the Brits ripped it off retrospectively. That Howlin is being overlooked while that insipid Disclosure album gets lauded for being lukewarm is a real travesty. These guys are just as smart with a melody, but with six times the soul. Standout tracks include “The Throw” and “Come Save Me”, but the whole package seems to come and go far too quickly with each listen. Check it out.